Visit Tanzania and take part in hiking the Kilimanjaro via the Lemosho route on this 8 Days Lemosho Route with Crater Camp. Contact us to book this safari. We trek from Shira Hut/Shira 2 or Shira Cave Camp to Lava Tower (4642m). Shortly before the Lava Tower the Lemosho Routemerges with the Machame Route. If the weather’s good you can ask your guide to lead you to the summit of the Lava Tower (4688m) where the views are excellent. Lunch is normally taken at the foot of the tower. Distance from Shira Cave Camp to Lava Tower is 6.6km. Afternoon acclimatization excursions from Lava Tower to Arrow Glacier Camp before returning to Lava Tower Camp to overnight. Trek from Lava Tower Camp (or Barranco Camp if used) to Arrow Glacier Campsite (4871m). Though only a short distance is coveredtoday – 2.5km, taking approximately 1.5 hours, the walk is still exhausting. Afternoon acclimatization excursions on the Western Breach Assault route. You probably won’t feel like eating but please endeavour to do so as you’ll need the energy reserves. You are advised to get all your gear ready for the summit bid before you go to sleep as you may feel disoriented when awoken for the assault at 0500. Around 0530 (your guide will judge the time that is optimal for you based on your pace thus far) quit camp for the assault via theWestern Breach / Crater rim (5725m) to the summit. The Western Breach assault route to the summit, while the shortest, time wise, is also the steepest. This morning is very difficult and you’ll need to commit to fight for the crater rim. You will inevitably feel like giving up and going to sleep. This is normal and can be overcome with perseverance. When resting please ensure you only stand or sit and do not lie down or close your eyes. Please trust your guide; he is very adept at judging whether your condition will allow safe progress or whether you have succumbed to a potentially dangerous condition and to proceed will not be safe. Nausea and headaches are normal and around a quarter of climbers will vomit during this assault. While very uncomfortable, these are not symptoms that are indicative of being at risk, per se. The onset of cerebral and pulmonary oedemaare marked by distinctive early warning symptoms that your guide is capable of identifying. Please maintain regular dialogue with him and frequently update him on how you are feeling. When you reach the crater rim you will sit, rest and admire the views out to the west, and the Furtwangler Glacier to your immediateeast. At this point the body often thinks you have finished your uphill fight and will be trying to coerce you into giving up and turning around. While you may genuinely believe that you have already exhausted your reserves in reaching this point, this is actually very unlikely to be so. Remember that you are only 170 vertical metres short of the summit, the journey from here is much less steep, and you have plenty of time for further pauses. If you do feel the need to give up at the crater rim please proceed towards Crater Camp (5729m) for just two minutes before making your final decision. In most cases this act of re-establishing momentum is enough to persuade the mind and body to co-operate with your intentions and you will ordinarily find hidden reserves for a final push, reserves that you were not aware you still had. From Crater Camp, it is only a short climb (max 1 hour) via the zig-zag track to the summit,passing Furtwangler Point at 5894m . On the summit your guide will advise how much time you can spend there in consideration of your condition, your timings, and the weather. The brain does not function very intelligently at this altitude so please remember to take many photographs in all directions or you will probably regret not having done so at a later stage. From the summit you will continue to press eastwards towards Stella Point (5752m) with the massive Southern Icefield, including Rebmann and Decken Glaciers, 100m to your right. 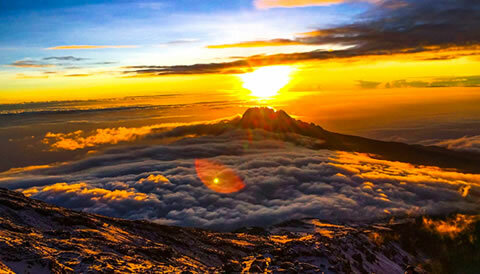 At Stella Point you may see climbers coming up the slope from their overnight camp at Barafu (4681m). After admiring the views out to the south-east, you will turn west and descend the gentle slope to the crater floor before returning to Crater Camp. Having settled and enjoyed refreshments at Crater Camp you have the option of requesting that your guide accompany you to the top of the Breach Wall to watch the sunset over the Shira Plateau. This morning, provided climbers are feeling strong and motivated and are judged by the guide to be in good health, we rise up from Crater Camp towards the very center of Kibo and the Reusch Ash Pit viewpoint at 5845m. From here views are enjoyed towards the summit and into the centre of the volcanic cone where fumeroles and sulphur emissions can often be seen. Strength permitting, we continue to circumnavigate the Ash Pit towards the Eastern Icefields and Stella Point, where we begin the descent to Barafu Camp, this time moving left of our ascent route into the Southeast Valley, descending via its loose scree slopes. There is clear logic is descending a loose scree slope; it is far easier on the knees and as the ground collapses underfoot if you take short quick strides it’s easy to maintain momentum. We do short bursts and take regular rests, pausing to photograph the Saddle beneath us and Kenya to our left. At Barafu Camp we have a short refreshment break before continuing to Mweka 3090m where we overnight again. This morning we descend from Mweka Camp to Mweka Gate (1641m) where we sign the summit register. After signing we descend a further 15 minutes on foot to Mweka Village to meet our transport, as the park authorities prefer groups’ vehicles to avoid congesting the area immediately beside Mweka gate as this is an important thoroughfare for casualty evacuations and is served by a single track road. Transfer from the gate back to Arusha. You should return back to Arusha sometime between 2 and 5pm, depending on your descent pace. Distance from Mweka Camp to Mweka Gate is 8.5km. End of the 8 Days Lemosho Route with Crater Camp.